Focuses on the next 20-25 years. Will be revised to address public comments and a final Comprehensive Plan will be adopted by City Council. Will be implemented through the Land Development Ordinance, zoning adjustments, and city projects (roads, sidewalks, key buildings). Establish architectural and site design standards for commercial & multi-family developments and possibly for houses in order to preserve Biloxi’s historic character. Preserve & support historic buildings, seafood industry, etc. Concentrate growth at the north of Biloxi (Woolmarket) around compact, mixed-use centers to preserve the surrounding low-density uses. Pursue road projects in the East Biloxi area, including the Pine Street extension (to connect Back Bay Blvd to Hwy 90) and the Bayview Avenue widening (between Caillavet and Lee Streets). Consider creating an East-West corridor adjacent to and parallel to the CSX railroad (long-term idea, few details are available). 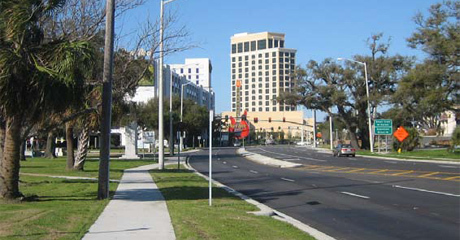 Connect the casinos with a streetcar loop along Caillavet Street, Bayview Avenue, Main Street, and Hwy 90. In East Biloxi, create new bike lanes, walk/bike paths, and a “Biloxi Peninsula Path” that connects to the Biloxi Bay Bridge and extends along Front Beach as well as along the Back Bay, ending at the IP Casino. Promote tourism focusing on arts, culture, history, and the seafood industry, including a ‘Museum District’ around the Ohr-O’Keefe site and a ‘Seafood Village’ on the Back Bay. Buy or restrict development of environmentally sensitive and flood prone land, such as low-lying and vacant parts of East Biloxi, to save as open space or for parks, urban agriculture, etc. Develop Point Cadet with pedestrian and visitor amenities. Market rate housing and rentals are recovering quickly; however, there is a need to provide affordable options for low-to-medium income families (something the Biloxi Housing Authority is deeply involved in). Attract retail and restaurant development to Downtown Biloxi. Provide docking space and support facilities on a long-term basis to maintain the Back Bay in East Biloxi as the center of Biloxi’s shrimp and seafood industry. Establish an ‘Innovation Center East Biloxi’ as a business incubator like the one on Popp’s Ferry. Promote Oak Street as an International/Mixed-Use District (few details given). Develop catalyst sites including a 10-acre city-owned parcel on Howard Avenue, the Harrison Court site, and properties on North Main Street. Focus workforce housing along Division Street. Again, the full draft of the comprehensive plan is available here.